NEA welcomes the opportunity to comment on Ofgem’s proposals to further strengthen the controls on marketing activity by gas and electricity suppliers.As a charity whose primary objective is the elimination of fuel poverty we recognise that cutting fuel costs by switching to a more competitively priced supplier can make an important contribution. Consequently we acknowledge that direct selling can have benefits for low-income and disadvantaged consumers. However we share the widespread concern about misleading and fraudulent sales practices and endorse the view that these are totally unacceptable. The evidence that it is often the most vulnerable consumers who are on the receiving end of this abuse is particularly disturbing. Given the persistence of these problems and the industry’s evident reluctance to act with the vigour required to eradicate them we question the decision to adopt an interim target which focuses only on the two worst performers. In our view Ofgem’s starting position should be that one complaint is one too many and that any complaint which is justified should not go unpunished. Therefore the concepts of setting a target for complaints which is stable over a period and the need to set a target which is achievable are themselves a cause for concern since there is no indication that Ofgem believes that the desired target is zero. Furthermore it is perplexing that some of the factors which Ofgem sees as creating scope for fluctuation in the level of complaints should be considered in any way problematic. Greater awareness of energywatch and improvements which make it easier for consumers to contact it are positive developments but the implication seems to be that because this may cause complaints to rise this makes setting a target more complicated. At root the current approach seems to focus on establishing a level of complaints that the industry can live with. Of course allowance has to be made for the fact that some complaints are frivolous or malicious, although it seems doubtful that many of these are pursued to the point that they appear in energywatch statistics. If they do there should not be any problem in energywatch exercising its judgement in eliminating them from any analysis. Our other general concern is that the procedures anticipated are concerned exclusively with industry processes. Even supposing that they do result in financial penalties and some bad publicity these arrangements offer nothing to those consumers whose experience of direct selling is sufficiently unsettling to prompt a formal complaint to both the company and subsequently to energywatch. NEA believes that every consumer with a justified complaint should receive compensation and that Ofgem should set a statutory minimum for compensation payments. 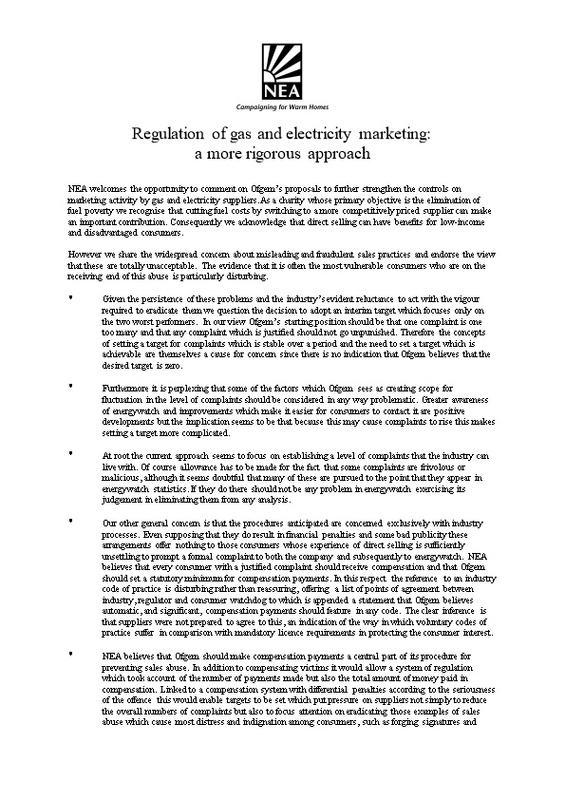 In this respect the reference to an industry code of practice is disturbing rather than reassuring, offering a list of points of agreement between industry, regulator and consumer watchdog to which is appended a statement that Ofgem believes automatic, and significant, compensation payments should feature in any code. The clear inference is that suppliers were not prepared to agree to this, an indication of the way in which voluntary codes of practice suffer in comparison with mandatory licence requirements in protecting the consumer interest. NEA believes that Ofgem should make compensation payments a central part of its procedure for preventing sales abuse. In addition to compensating victims it would allow a system of regulation which took account of the number of payments made but also the total amount of money paid in compensation. Linked to a compensation system with differential penalties according to the seriousness of the offence this would enable targets to be set which put pressure on suppliers not simply to reduce the overall numbers of complaints but also to focus attention on eradicating those examples of sales abuse which cause most distress and indignation among consumers, such as forging signatures and intimidatory behaviour. Such a system could readily incorporate financial penalties over and above the payments made to consumers themselves and we believe it might have more impact in publicity terms. This effect would be further enhanced if case studies were incorporated, as evidenced by the recent Nacab report on its clients’ experience of dealing with fuel suppliers. Previous efforts to strengthen the licence requirements on marketing activity included a requirement that suppliers audit consumer satisfaction with sales procedures. NEA is conscious that complaints statistics are the tip of the iceberg. Consequently it is surprising that Ofgem makes no reference to these internal audits, even though we acknowledge that lack of independence may compromise their accuracy. But making any judgement about them is impossible since none of the findings are, to our knowledge, in the public domain. Even so, it seems to us that the procedures which Ofgem proposes for reducing complaints could equally well be applied to driving up standards of customer satisfaction in that targets could also be set for these audit results, preferably with independent verification of their veracity. More generally, whilst we understand the focus on complaints, given that these appear in MP’s postbags and other high profile places, there would be merit in also focusing on some straightforward measures which Ofgem could take to improve standards. For example sales agents could be required to provide written information on tariffs and charges. They could also be required to provide written details of how consumers can make price comparisons themselves, including by reference to energywatch price comparison information. This would help Ofgem to achieve another of its objectives by promoting informed choice by consumers, thereby ameliorating the tendency for them to accept the first offer they encounter and to take it at face value.